AGI Marketing is an El Paso-based creative team of developers, designers, marketing experts, and writers. We help businesses thrive in the new digital paradigm. For businesses of all types—local, startups, and mid-size enterprises—it’s becoming more and more difficult to stand out and reach people in the cluttered internet landscape. 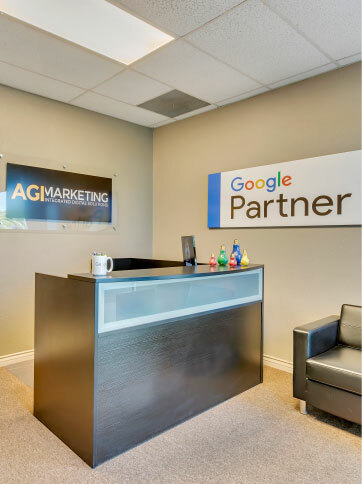 AGI employs the latest digital marketing strategies, research, and techniques to get businesses visibility and exposure that connects with customers. Our analytical and creative production team work together to build the online presence needed to get your company found online. The internet marketing industry is constantly changing. It requires perpetual adaptation, tracking, and monitoring. We use our expertise to drive your business to the next level. From applying the fundamentals of Search Engine Optimization (SEO) to creative and responsive web design and development, engaging content, reputation management, pay-per-click advertising, and effective and personalized social media campaigns, AGI infuses your business with new opportunities. The internet is more than just zeroes and ones; it’s the place where the world connects, shares, and creates. From a dedicated machinist engineering his next coffee roaster in a Nevada workshop to a boutique redefining fashion in the Sun City, or a family medicine clinic treating the sick, and a third generation construction company in Southern New Mexico—AGI is putting local businesses across the U.S on the digital map. It’s more than just business; it’s about people’s lives. When businesses and private enterprises grow, communities prosper, economies are fortified, and families are strengthened. We know the power of effective internet marketing, and we want to share that with hard working business owners all across the country. Our mission is to connect businesses with new customers. Through SEO, website management, and internet marketing services, we help businesses across the U.S. achieve more. We create. We think big. We find digital solutions. Our vision is to help local businesses across the U.S. build an online presence and personalized marketing strategy that propels them towards growth and success. The AGI code is driven by principles of integrity, trust, teamwork, and respect. We apply these across the board: with our in-house team and with the many business owners we interact with every day.